Avocado: Can I Feed it to the Chickens? Every time I toss something in the compost bin these days, I wonder: Can I feed it to the chickens? Turns out I’m not alone, and there are tons of lists and discussion forums out there that suggest treats and trouble alike among your kitchen scraps, and some are overwhelmingly comprehensive and hard to look at. Not all of them offer up reasons certain items are blacklisted for chickens in particular, explain what could happen if a bird does ingest part of a problem plant, or provide links to reliable sources, and most are walls of text and tables. So I decided to embark on a graphical series depicting some of the most-agreed-upon do’s and don’ts, including specifics on which part of a food is unsafe for the flock and why, with a few sources for further reading. As it’s summer here and we’re getting tons of yummy avocados in the veggie box, here’s the first and most pressing entry. Short answer: I’m not planning on it. The plant’s pit, skin, leaves and bark contain a fungicidal toxin called persin, which can leach into the flesh of the fruit, especially if the pit has split. Unlike humans, cats, and dogs, chickens (and in fact most pet birds) are very sensitive to persin toxicity, and their unique anatomy which includes airsacs and other avian organs makes it hard to treat. Symptoms of persin toxicosis you may notice include the inability to perch, labored breathing, disordered plumage, unrest, weakness, and apathy, and high doses can result in death within 24 hours. Yikes! There seems to be no question the vast majority of the avocado plant is highly toxic to chickens. Some people report feeding the flesh of the avocado to their flock will no ill effects, but it’s helpful to remember that this particular part of avos is a) delicious, b) not really a food scrap and c) expensive compared to other chicken foods. For these reasons and especially because varieties contain differing amounts of persin and leaching is difficult to gauge, I’m going with definitely not. 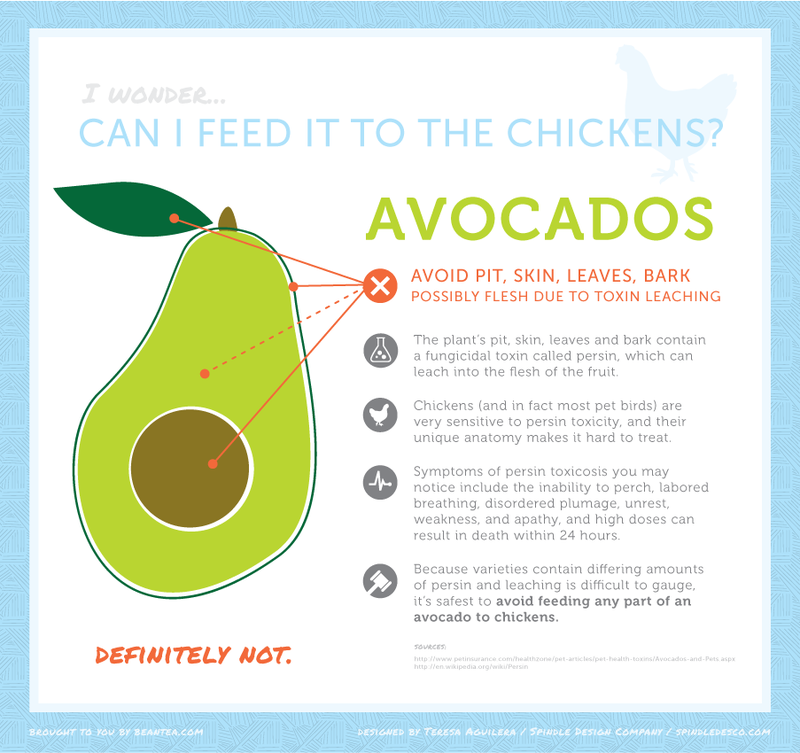 It’s safest to avoid feeding any part of an avocado to chickens. Teeny but emphatic disclaimer, following the lead of Cornell University’s helpful Department of Animal Science: This series is only meant to be informative, not prescriptive. The author(s) of this site do not endorse or recommend the use or disuse of these plants and take no responsibility for the health of your flock. There are many poisonous plants and substances which are not represented here. Please do not assume that a specific plant or plant part is safe just because it is not profiled. If you’re not sure, better to be safe than sorry; never feed questionable items to your chickens.